If Bitcoin bulls got excited about the recent move up, Thursday’s action extinguished some of this excitement. But it doesn’t come as a surprise to our readers. This one day of strong depreciation can be seen as an indication of things to come. But are these things bearish? In another blow to bitcoin and cryptocurrencies, BIS warned investors and traders that they could lose money on privately minted cryptocurrencies like bitcoin. BIS, which serves as a lender to country's central banks, found most countries regard bitcoin and cryptocurrencies as a niche technology and not the future of money that many crypto enthusiasts believe it to be. "No central banks reported any significant or wider public use of cryptocurrencies for either domestic or cross-border payments in their jurisdictions," the BIS report, out last week, found. "Usage of cryptocurrencies is assessed to be either minimal (‘trivial/no use’) or concentrated in niche groups." The survey revealed that most BIS member central banks think cryptocurrency use "will remain minor" due to "low retail acceptance, compliance issues, better public understanding by the general public of the risks involved and, for some jurisdictions, outright bans." The factors the BIS mentions are not new ones. They are the hurdles that have been present in the Bitcoin market for years now. The warning itself also reads like warnings we have seen come out from other regulatory or financial organizations. What’s a bit distinct is the tone of the warning in that central banks seem to think that Bitcoin is bound to remain a niche technology. Whether this is true or not remains to be seen and no one can tell with certainty. This doesn’t necessarily mean that Bitcoin can’t be an attractive asset. The fact that it is not correlated with traditional asset classes suggests that digital currencies have a role to play in the financial market. So, we certainly wouldn’t dismiss Bitcoin out of hand. On BitStamp, we saw a drop that concentrated in one day, Thursday, January 10, 2019. This action might herald a shift in the short-term outlook. This one-day drop brought Bitcoin below the 23.6% Fibonacci retracement level. This opens Bitcoin up to even more declines from the short-term perspective. The immediate level to which Bitcoin could depreciate now is around $3,000-3,100. Such a move could transpire any time now. Another bearish indication is the fact that the breakdown below the retracement is now confirmed and it is yet another confirmed move down below this level. You could also reverse this argument: this is yet another failed breakout above the retracement. This is also a bearish hint, and such a perspective is perhaps an even more bearish one. 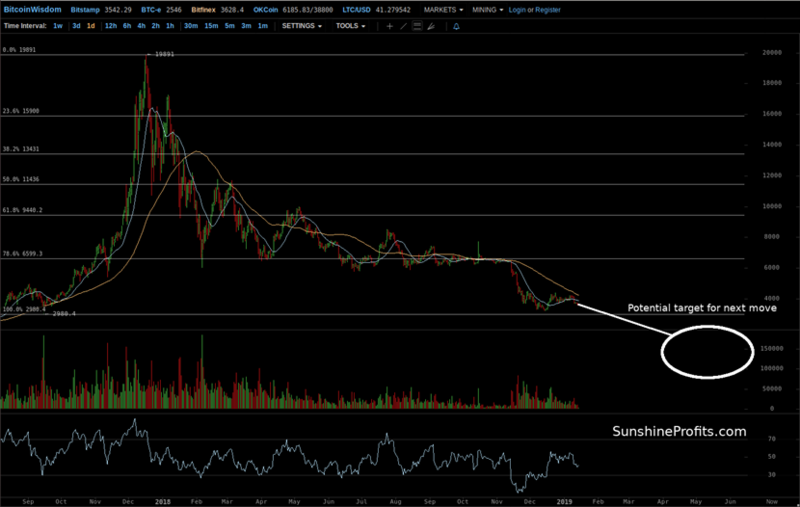 Again, $3,000 is the support level which could temporarily stop the current decline. Beyond $3,000, the move could easily accelerate. On the long-term Bitfinex chart, we are seeing the current decline in perspective. We see clearly that Bitcoin is well below the 78.6% Fibonacci retracement level. Actually, we are closer to the 100% retracement. If we take a look at the action in Bitcoin, as seen from the long-term perspective, the currency plummeted after it broke below the 78.6% retracement, then bounced up from the proximity of the 100% retracement and is now back in retreat. This suggests that the next important trigger for the trend to continue is this 100% retracement. It coincides with the $3,000 level. The current situation is remarkable in the sense that both the short- and the long-term indications are aligned to the point of highlighting the same level. From the short-term perspective, the $3,000-3,100 level is one to observe. The long-term point of view suggests that $3,000 could be the trigger. Combine that and $3,000 is the level to watch, reinforced from two perspectives. The RSI suggests that there might be a lot of room for the decline. What beyond $3,000, then? The next low is the level of the July 2017 low, which is around $1,800. This definitely seems far-fetched when you look at Bitcoin and see it around $3,500. But wouldn’t a move to $3,500 seem far-fetched in early November 2018? And yet we saw one. So, a move to $1,800 is not as fanciful as it may seem. 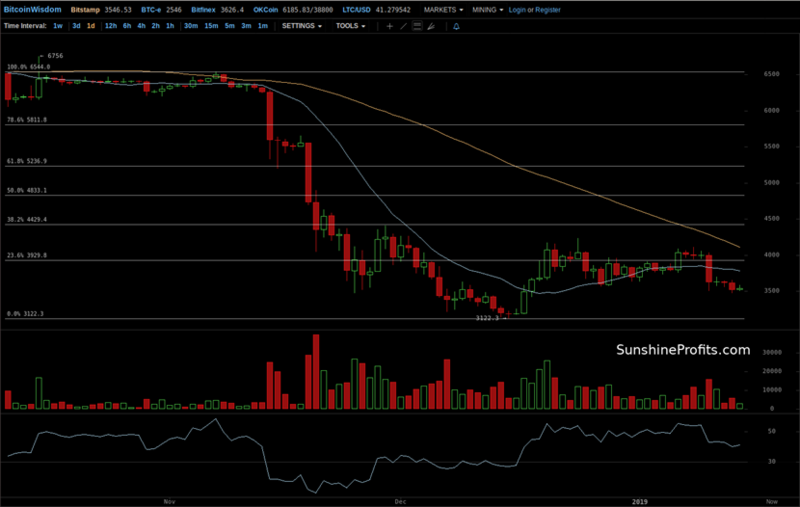 If we see a breakdown below $3,000, then a move to $1,800 will become a tangible possibility. Summing up, a breakdown below $3,000 would serve as a bearish trigger. If you have enjoyed the above analysis and would like to receive free follow-ups, we encourage you to sign up for our daily newsletter – it’s free and if you don’t like it, you can unsubscribe with just 2 clicks. If you sign up today, you’ll also get 7 days of free access to our premium daily Gold & Silver Trading Alerts. Sign up now.